Simply put, in order to be successful, business owners need goals! But how do you align your marketing and business goals? Great athletic teams (Berra’s included) know that great results are the outcome of a team that works together at a high level of performance to achieve common goals. Business teams that succeed have goals that are well-defined, not unclear or just assumed. And especially, success includes having marketing goals that are based on business goals. Why should I set goals for my small business? 1. What is a goal? It’s a defined outcome, a result, the aim of a journey, a destination. 2. Why define business goals? A large body of evidence indicates that a business leader who clearly defines and articulates his/her vision of the destination generates a stronger, more aligned team which produces better results. 3. What are the purposes of business goals? It is critical to understand that without a specific goal, it is difficult to know that you’ve achieved what you want to achieve. It is like traveling without a map. 4. How do I know if I’ve set the right goals? 5. What is the relationship between marketing goals and business goals? Marketing is a key driver of business success. So, marketing goals or marketing and sales goals, need to be clearly identified and aligned with business goals. Following are some examples of goal elements. Each, to be an effective goal, will need to be more specific—also known as SMART goals. Identify specific outcomes that you want to achieve. Put a measurable number to each specific outcome — a number you can track. Select goals that will lift and drive the organization forward. While you will want to ‘stretch’ for progress, the actions and numbers you select need to be reasonable, so as not to demotivate or distract your team. Along with the rigor of this goal-setting process, put dates to each goal that will give you the discipline of measured progress. 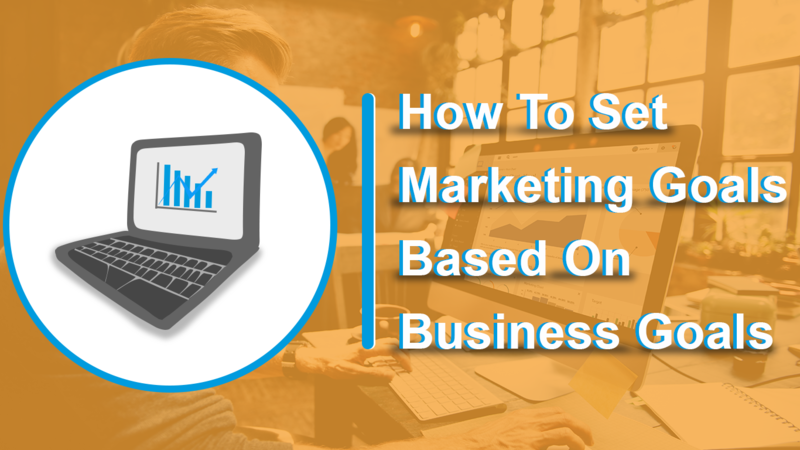 Why is it Important to have Marketing Goals Based on Business Goals? The great business leader and strategist Stephen R. Covey said in his book, The 7 Habits of Highly Effective People: “If the ladder is not leaning against the right wall, every step we take just gets us to the wrong place faster.” The point is that it is critical to make sure that marketing efforts are focused on the actions that will achieve the right business goals. Marketing efforts will be judged on business results, not on pure effort or good intent. So, set clear business goals first, then share them with the organization so that supporting goals are all properly aligned, with specific goals for each functional or staffing area. Every business and every enterprise wanting to achieve progress needs clear goals. Small business goals are every bit as important as goals for large companies. Marketing goals, (or sales and marketing goals) are equally essential in any size organization, and making smart goals is fundamental to success. ➤ Start with these goal ideas and narrow them down for your business and what you are trying to achieve. ➤ Next set a deadline of just a little less time than you think you need to achieve it. That way you have some good pressure on you to perform. ➤ And finally, once your goal is in place, review progress weekly to make small improvements while getting there. Once you get everyone on your team on the same page driving towards a goal, it’s amazing what can be accomplished. Is there a specific business or marketing goal you try to improve on every year or every quarter? How do you determine marketing and business goals? Keep the discussion going in the comments section below.